Never to disappoint she always gives us a look to remember. JLO in Atelier Versace, of course gave us face and body which we will never grow tired of but it would be nice to see her try something out of her comfort zone. We know she can do mesh illusion like no other so its time to see what else is in her closet. 18-year old Zendaya truly proved 'Age Aint Nothing but A Number' especially when it comes to slaying red carpets. The plunging, sun printed gown with matching tiara looked stunning on the teen and the asymmetrical trail made the look nothing less than pefection. Can we take a second to relish in Zoe Kravitz beauty. Gorgeous beyond belief!! She could have shown up in a towel and I still believe no one would have cared because you just can't stop staring at her face but instead she went with her long time friend Alexander Wang. For a celebrity like Lady Gaga, wearing a gown like this happens every day but its nice to see her attire fit the event she's attending. Kim Kardashion-West looked pretty as always. Thats her look, thats her thing, we've come to expect it. Again this is the moment to strike out and take any risk you want and Solange did just that!! Solo embodies fashion, she's always on the cutting edge. Some may not understand it or even like it but she owns every look!! 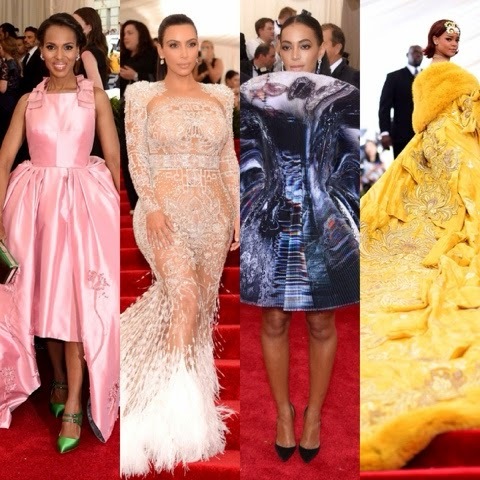 Rihanna, not only understood the theme she took it as far as it could go!!! Revealing that this luxurious fur trimmed cape with a train by designer Guo Pei took two years to hand make. This is how you kill a red carpet. While everyone gaged over most the celebs that had already shown up last night there was still high anticipation for Queen Bey's arrival some even buzzing that she wouldn't be there. Almost an hour late Beyonce graced the carpet with her presence dripping with embellishments. The sheer Givenchy gown left little to the imagination but still sent all of social media into a tizzy. There is no other girl who can have us waiting on her just to 'Bow Down' when she shows up. Completing the look with a blonde side pony tied it all together.